Camera and video recording devices have been getting smaller ever since things went digital. Designers were able to eliminate all mechanical parts from the devices once flash memory became available. Without any moving parts, cameras and digital video recorders could be reduced to pin-hole size and could be hidden in ANYTHING. Most of today’s cell phones and laptops have digital video capabilities, but even everyday devices such as pens, watches, and teddy bears can be made video-capable. 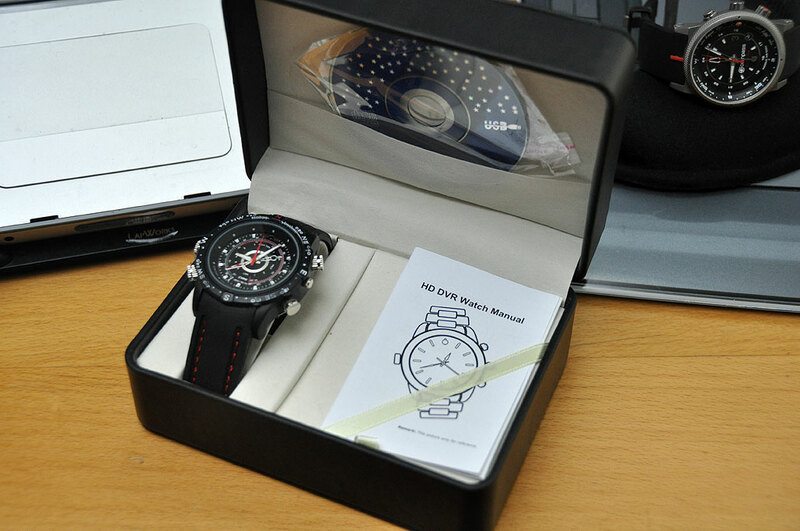 This sporty-looking watch may look like a high-end chronograph, but it is actually a camera/video recorder from USB gadget master Brando. The camera is capable of image resolution of 3264×2448 and video resolution of 1280×960 pixels at 30 FPS. It is powered by a rechargeable Li-ion battery and has an internal memory of 4GB. In addition to its various (audio, image, video) recording capabilities, the DVR watch is also a watch. However, it is NOT a chronograph, nor does it have any compass functions, indicators on the bezel notwithstanding. There are multiple screws and buttons on the sides. Their functions are not obvious. One must memorize a few sequence of buttons in order to activate the watch’s functions. The watch is water-resistant when all of the screws have been tightened down. The band has contrast stitching, is made of silicone, and it very comfortable on the wrist. The DVR watch does not use a replaceable battery, but has a rechargeable Li-ion battery. To charge the watch for use, a special USB cable is inserted into a port on the side. The red LED indicator will go out when the watch has been fully charged. Once we’ve powered up this watch, we’ll see what kind of images and videos this watch is capable of recording. Typically, these types of devices can produce acceptible images and recording in brightly lit environments, but perform quite poorly in low-light situations. This is our expectation for this Brando video watch, but we would be delighted to be proven wrong.